Riyadh Metro ... this is Tecon’s second order in the project. Last year, in response to increasing demand for diverse engineering solutions in the region, the UAE-based Albatha Holding consolidated seven companies within its engineering group, thus creating one strong platform offering specialised engineering solutions: Tecon. This entity – which started out in 1975 as a local electrical company – is now one of the region’s largest and most respectable solution providers in the electrical/engineering field with the ability to handle a diverse range of projects. From the academic and retail to recreational, hospitality, residential, and commercial sectors, the company has left a lasting impression in every sphere. Its list of ongoing projects includes some of the prominent ones in the region including the Warner Bros World Abu Dhabi Theme Park, a development for the Supreme Council Abu Dhabi, Constellation Monument in Abu Dhabi, the Badr Project Dubai and the Pointe Mall Dubai, to name a few. 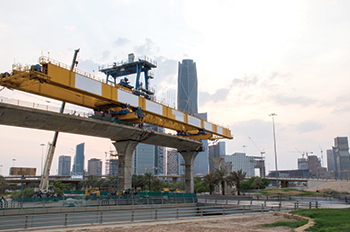 The company has now clinched a second order from Riyadh Metro in Saudi Arabia, having previously supplied earthing products for the project which have been specially designed for the metro sector, Naveed Ansari, CEO of Tecon, tells Gulf Construction. The Riyadh Metro project covers the construction of a rapid transit system, comprising six metro lines, for the Saudi capital city. “Tecon has been awarded a $6.7-million contract to provide the project with the central battery system, emergency and handrail lighting for lines Four, Five and Six,” he says. The project is being led by Tecon’s assistant general manager for Saudi Arabia, Khaled Abu Zaid, under the supervision of Ansari. 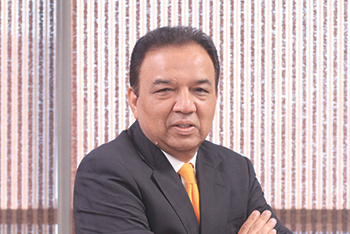 Ansari attributes Tecon’s success in clinching the deal to its reputation as a solution provider, technical contributor and a provider of a whole range of other electrical/mechanical products. “The emergency lighting systems are designed as per the local authority’s civil defence regulations and relevant prevailing International standards,” he adds. Its other projects in Saudi Arabia have included the Jeddah Tower and King Abdulaziz International Airport, Madinah Airport, Taibah University, and Gulf Juice Factory. Tecon’s completed mega projects in the UAE include the Dubai Mall; Emirates Towers; Madinat Jumeirah; the Mall of the Emirates; the Grand Mosque; the Grand Hyatt – Abu Dhabi; the Yas Marina Hotel; Al Dar headquarters; and Ferrari World, among others. In Oman, Tecon is involved in the Village Retail Centre at Wave Muscat, Muttawar residential development, strategic food storage facilities at Al Kamel, Saeed Bin Nasser Al Kindi Boys School at Al Hajar, Stage One of Duqm Hotel, Royal Oman Police (ROP) Music School, and Zauliyah Gas Compression. Apart from supporting clients in the design, planning and development, and execution stages, Tecon provides competent after-sales and maintenance services. Ansari says Tecon has, over the years, utilised a more customer-centric approach, providing clients with a broad range of specialised engineering solutions to achieve success. “Being customer-centric, we remain steadfast in our commitment to support our customers with regular training and technical support. And we have specially established a training centre in our Dubai office for this,” he adds. Ansari says the company will continue to invest in new technologies as it maintains a futuristic approach. He adds that like other engineering companies in the region, Tecon is facing a number of challenges but given the company’s experience in tackling several such situations over the past 70 years, he believes that “the company’s resilience and determination will enable it to ride over this uncertain time as well”. Overall, Ansari says, Tecon is optimistic about the growth prospects, especially in the engineering and construction sector in the region.